Santa Fe County (Spanish: Holy faith) is a county in the U.S. state of New Mexico. As of the 2010 census, the population was 144,170, making it New Mexico's third-most populous county, after Bernalillo County and Doña Ana County. Its county seat is Santa Fe, the state capital. 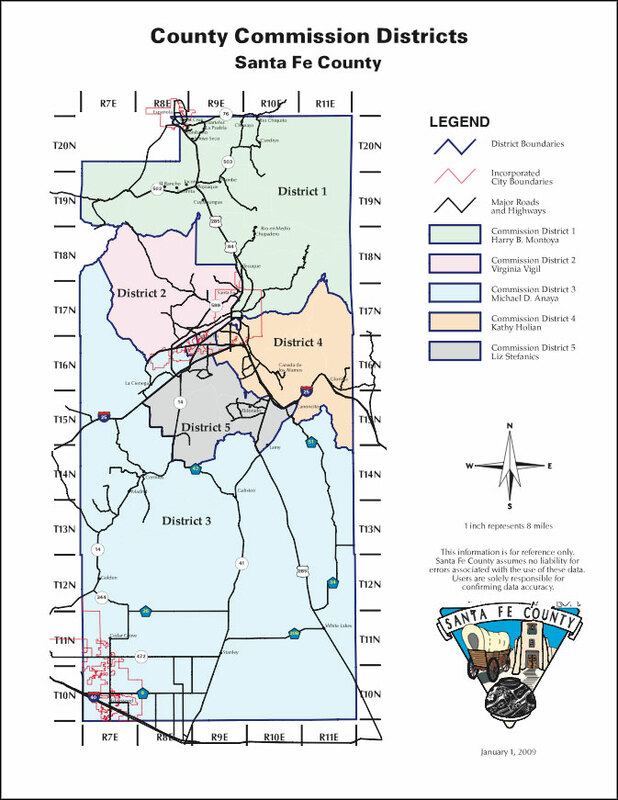 Santa Fe County comprises the Santa Fe, NM Metropolitan Statistical Area, which is also included in the Albuquerque-Santa Fe-Las Vegas, NM Combined Statistical Area. According to the U.S. Census Bureau, the county has a total area of 1,911 square miles (4,950 km2), of which 1,909 square miles (4,940 km2) is land and 1.5 square miles (3.9 km2) (0.08%) is water. 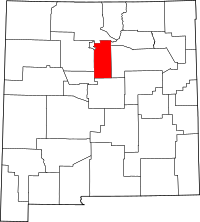 It is the fifth-smallest county in New Mexico by area. The highest point in the county is the summit of Santa Fe Baldy at 3,847 meters (12,621 ft). It is drained by the Rio Grande and several of its small tributaries. As of the 2000 census, The population density was 68 people per square mile (26/km²). There were 57,701 housing units at an average density of 30 per square mile (12/km²). There were 52,482 households out of which 30.4% had children under the age of 18 living with them, 45.5% were married couples living together, 11.7% had a female householder with no husband present, and 37.5% were non-families. 29.4% of all households were made up of individuals and 7.4% had someone living alone who was 65 years of age or older. The average household size was 2.42 and the average family size was 3.01. In the county, the population was spread out with 24.1% under the age of 18, 8.1% from 18 to 24, 29.7% from 25 to 44, 27.3% from 45 to 64, and 10.8% who were 65 years of age or older. The median age was 38 years. For every 100 females there were 95.8 males. For every 100 females age 18 and over, there were 93.4 males. The median income for a household in the county was $42,207, and the median income for a family was $50,000. Males had a median income of $33,287 versus $27,780 for females. The per capita income for the county was $23,594. About 9.4% of families and 12% of the population were below the poverty line, including 15.2% of those under age 18 and 9.7% of those age 65 or over. As of the 2010 census, there were 144,170 people, 61,963 households, and 36,183 families residing in the county. The population density was 75.5 inhabitants per square mile (29.2/km2). There were 71,267 housing units at an average density of 37.3 per square mile (14.4/km2). The racial makeup of the county was 76.2% white, 3.1% American Indian, 1.2% Asian, 0.9% black or African American, 0.1% Pacific islander, 15.1% from other races, and 3.6% from two or more races. Those of Hispanic or Latino origin made up 50.6% of the population. Of the 61,963 households, 26.9% had children under the age of 18 living with them, 42.1% were married couples living together, 11.0% had a female householder with no husband present, 41.6% were non-families, and 33.7% of all households were made up of individuals. The average household size was 2.28 and the average family size was 2.94. The median age was 43.0 years. The median income for a household in the county was $52,696 and the median income for a family was $64,041. Males had a median income of $41,703 versus $39,215 for females. The per capita income for the county was $32,188. About 10.0% of families and 14.4% of the population were below the poverty line, including 21.4% of those under age 18 and 7.3% of those age 65 or over. The county is governed by a five-member county commission, whose members are elected from single-member districts (see map). Elections are partisan and all five seats are currently held by Democrats. County commissioners serve four-year terms, with term limits preventing them from serving more than two full terms. The New Mexico Corrections Department and the Penitentiary of New Mexico are located in an unincorporated area in the county. ^ Ripley, George; Dana, Charles A., eds. (1879). "Santa Fé, a N. central county of New Mexico" . The American Cyclopædia. ^ "Directory Archived December 9, 2009, at the Wayback Machine." New Mexico Corrections Department. Retrieved on December 7, 2009. ^ "Penitentiary of New Mexico, Santa Fe." New Mexico Corrections Department. Retrieved on December 7, 2009. Wikimedia Commons has media related to Santa Fe County, New Mexico. "Santa Fé, a N. central county of New Mexico" . The American Cyclopædia. 1879.